Black Swan Racing is a ProAm (professional-amateur) car racing team competing in the Intercontinental GT Challenge, a four race championship that will take them and their vehicles across the globe. They’ll push their cars and their team to the limit with endurance races, including a race in Spa, Belgium that will last 24 hours. 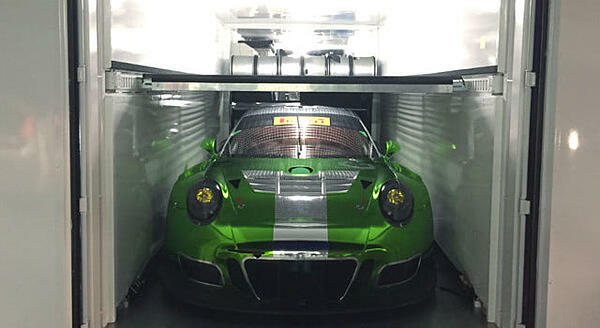 As the team travels the world, their iconic car, a beautiful green Porsche 911 GT3R, has to come with them. 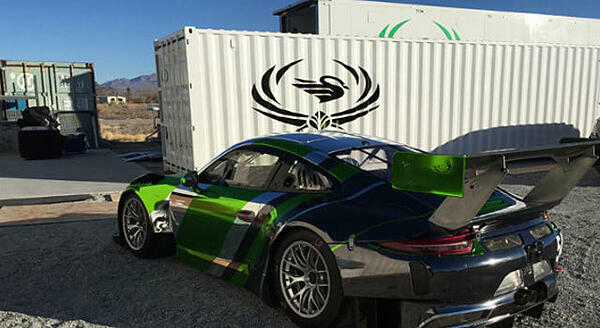 Many racing teams use a plain, tried and true shipping container to transport their vehicles overseas. But Black Swan Racing saw the opportunity for a shipping container to be something more: a mobile garage worthy of the high-performance vehicles it would carry. “We asked ourselves, how can make the container not just a tool to carry the car but a way to keep everything organized,” said Dan Cross, Black Swan Racing’s manager. Bringing the garage to the race track had several advantages. When the car wasn’t in transit, they could have peace of mind knowing it was secure in a climate-controlled garage instead of baking in a hot box. A containerized garage is also efficient. In addition to shipping all of their equipment and the car as a single unit, Black Swan could create a consistent storage system. Once the container reached the track, the team could immediately get to work, knowing where each tool was—no packing and unpacking necessary. On top of the practical advantages, Black Swan Racing wanted to send competitors a message. “Everyone is trying to one up each other in racing, and the container is an untapped piece of equipment. We needed a container that said we mean business; we’re a professional, organized and efficient team,” said Cross. Falcon Structures installed an aluminum interior finish-out to create a storage space sleek enough to suit the car it would carry. Choosing metal walls and framing over wood also made moving container through customs much easier as customs agents are wary of lumber products that may harbor invasive pests. Behind the aluminum, the container is insulated with water and pest-tight spray foam insulation. 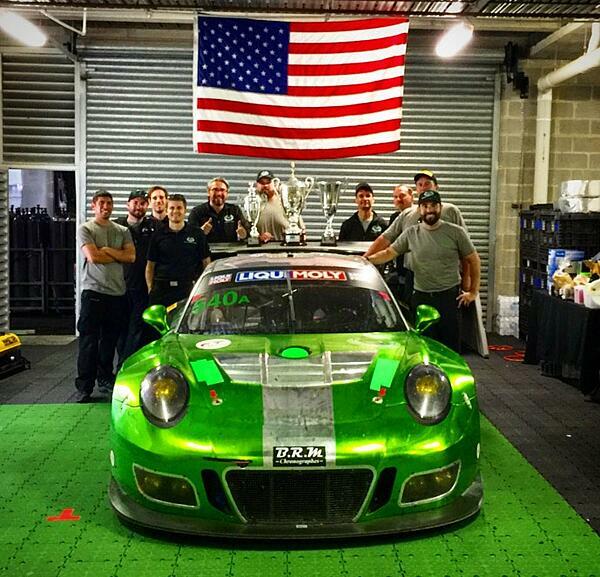 The simple white walls and chrome floor beautifully frame the vibrant green Porsche. 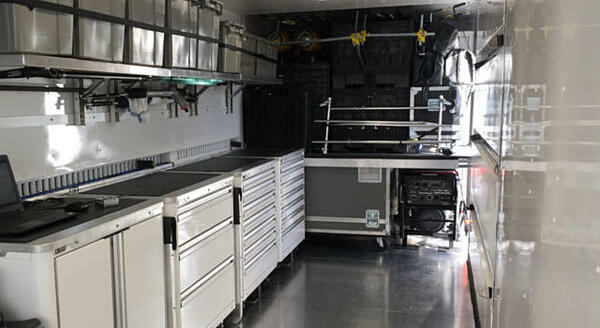 Black Swan Racing also installed modular cabinets secured with quick releases. They can pull out their cabinets and rearrange them into a long work bench outside the container at the track if they’re looking for extra room. To top it off, a beautiful exterior paint job sets Black Swan Racing apart. “People came over with container envy. Everyone who I’ve talked to says ‘Your container looks badass.’ It feels nice to have our own special thing,” said Cross. While the container is just one of many tools Black Swan Racing uses, we like to think their beautiful, air-conditioned and organized mobile garage gave Black Swan’s team a deserved confidence boost that helped them come in third overall in the pro-am class of the 12 Hours of Bathurst race. After their victory, the team drove the car into their container, and shipped it to the another race: The Grand Prix of Long Beach where the team entered three Porsches. We’ll be keeping an eye on Black Swan Racing when they travel to Spa, Belgium for round two of the GT International Challenge in July of this year. As they prepare for some of the most significant competitions of their racing careers, we’re proud to know that a Falcon Structures shipping container is representing an amazing team. Follow Black Swan Racing on facebook. 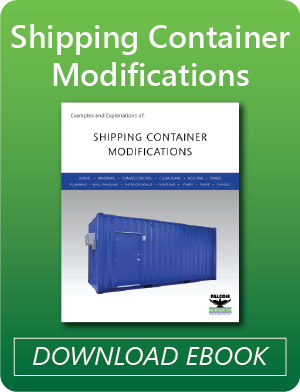 If you have a shipping container project in mind, we’re happy to answer your questions. Give us a call at 877-704-0177.